Your Mekong Delta tour can be an experience like no other! There’s one thing living by water, but what about living on water? We are not talking about canal boats or yachts, but real, properly constructed houses, bobbing up and down to the water’s flow. 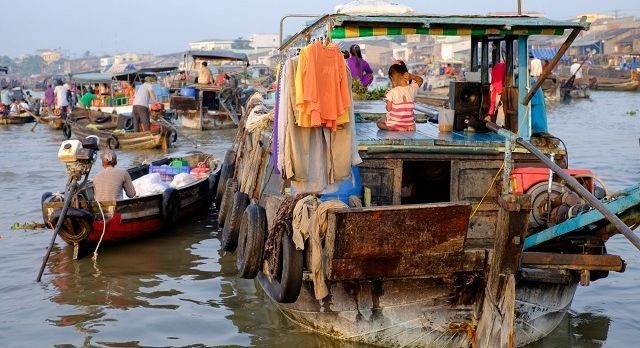 Welcome to the floating life on the Mekong Delta. The vibrancy of Vietnam’s Mekong Delta is astounding with its inhabited marshland forests, and the Mekong River, the world’s 10th longest river that commences in Tibet, and known by the Vietnamese as the River of Nine Dragons. Rich in resources but poor in power, over 60 million people live in this fertile region, adopting livelihoods as farmers and fishermen, living both on the banks of its tributaries but also on stilted houses. It is a lot cheaper to live here in Can Tho than in Ho Chi Minh (formerly Saigon) and so all the features one might expect from a model community – local shops, hospitals, schools and even places of worship – exist on stilts. 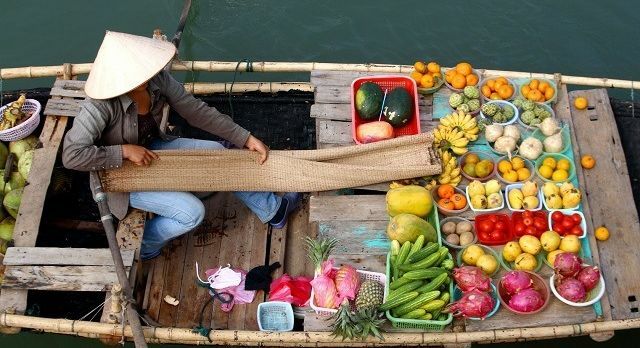 Buzzing with life, the Mekong offers up wonderful floating farms growing plants and flowers, and marketplaces where boats are piled up with colorful fruit and vegetables, rice and exotic seafood and an often squawky hawker adorned with a traditional conical hat. Did you know? Each boat has a mast with a sign that symbolize what is being sold – a pineapple here, or a turnip there. Small-scale industries is how Mekong people thrive, whether it is selling chips, crackers and sweets or operating a crocodile farm. To really discover this region you can stay ashore at a hotel like Victoria Can Tho, or a simple resort like Mekong Lodge, and relax. Alternatively, take an overnight cruise, such as the Bassac Cruise, where you can sail into the heart of the bustling and active floating markets and admire the verdant life of the paddy and sugarcane fields, where you can get off and and cycle through the region or go rowing in a traditional boat, or even enjoy a home-cooked meal as a guest of a local farmer. Fancy floating away on your private Mekong Delta tour? Get in touch with us today!